Happy Easter!! 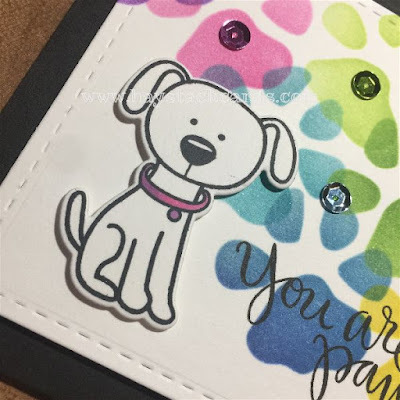 Today I have a quick and easy card to share using stencils and distress inks with the Simon Says Stamps Pawsome Cats and Dogs bundle. 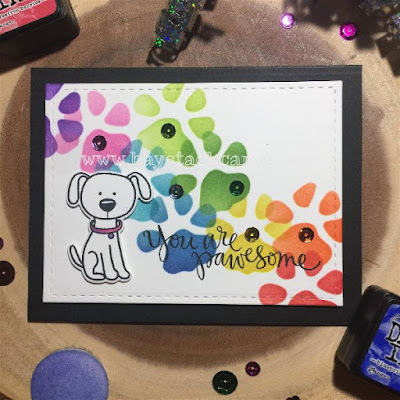 I stenciled the medium paw print in rainbow color distress inks onto a stitched die cut panel, overlapping each slightly along the way. Inks used were festive berries, ripe persimmon, mustard seed, blueprint sketch, mowed lawn, twisted citron, peacock feathers, picked raspberry, and wilted violet. Once the inking was done, I stamped the dog from the set in Memento Tuxedo Black and colored the collar with Copics. The coordinating die is also included in the bundle. He is secured to the card front with foam tape. 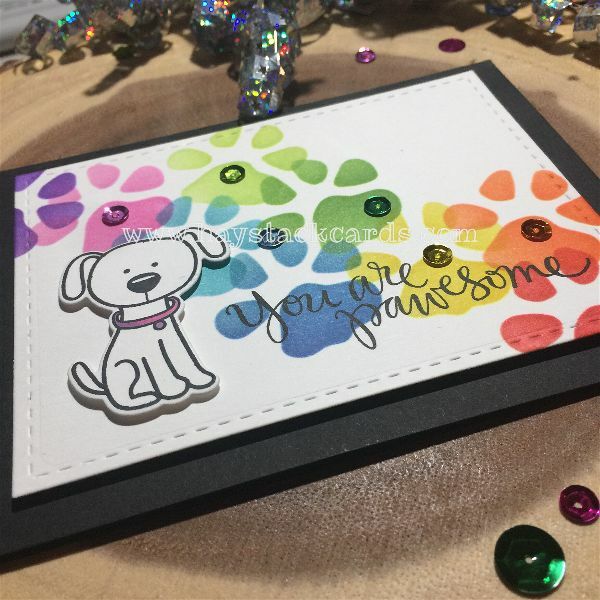 To finish off the card, I added a coordinating sentiment and added rainbow sequins with glossy accents. The stitched panel is secured to the black A2 size card base with craft foam for additional stability. I thought this would be the perfect thank you card for a dog lover or for our dog sitter when we go on our next vacation. Thanks for stopping by!! this is the cutest, fun rainbow paw prints! I am so glad you played along with us at simon says stamp wednesday challenge!